When I was a wee tike I was selected as part of the Royal Ballet Help the Poor South London Kiddies Scheme. It meant being bustled off each week to a cold, scary big hall and leaping from corner to corner and getting told off for not leaping gracefully enough by older ballerinas. I didn’t really like it much (what an ungrateful Beneficiary of Good Will!) and didn’t last very long. But before I had my last tussle with Mum about whether I could give up this opportunity I did get to perform in the Royal Opera House dressed as a giant chicken. Despite being a rubbish, ungrateful ballerina I can remember being so proud on that stage, and feeling so full of fancy, so unlike my clumsy self, I felt that even my leaping met the grade, as a flapped my way from stage left to stage right. I think I was probably the last child out of my suit. There is something about wings, even those wings of the inelegant chicken, that makes a child’s imagination soar. 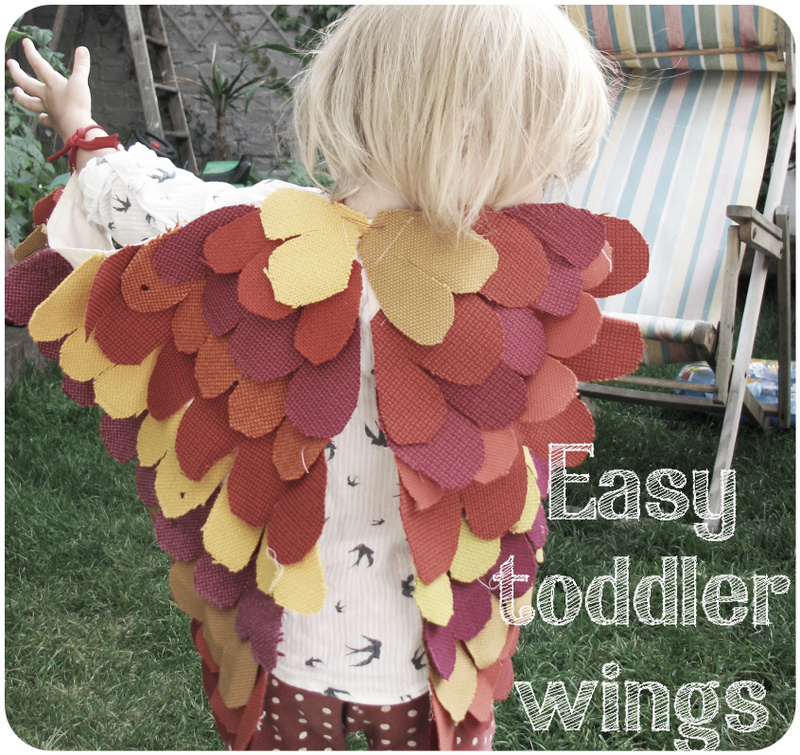 After seeing some images of a child in wings on the internet a few times, I decided I had to give this craft a crack and discovered just how irresistibly easy it is and what delight they provoke in children! It was such a simple craft, anyone could manage it with just some scraps of fabric and a sewing machine. 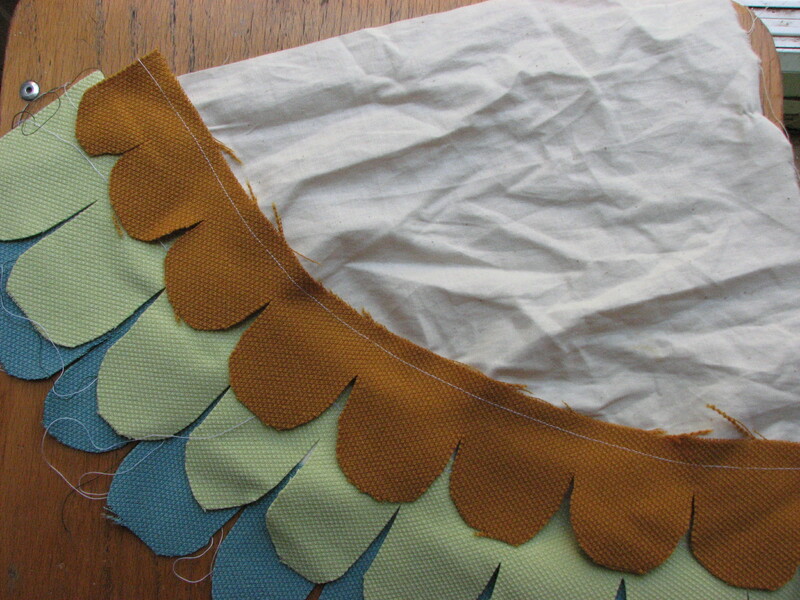 It did take a while cutting out all those reams of looping feathers, and it is fairly monotonous sewing the lines – but I am sure you all have a much higher boredom threshold than me! I used up some upholstery samples, so I had fantastic, bold colours but really just too heavy for tiny arms to happily flap for hours. You need a base that reflect the arm length of the child. I did 30 cm x 30 cm (for a 1-2 year old, would fit up to 3) and cut a loose curve between them. I then cut lots of loopy strands, beginning at 36 cm and getting smaller as you sew up into the corner. My strands were around 5 cm wide, but these could be any width- wider if you are lazier than me and want less strands or much less wide if you would like lots and lots of feathery layers. Best to leave a loop hanging off each end and then cut the loop smaller once you are all done. I just sewed straight along the top of each strand from corner to corner, wriggling and doing tiny tucks as I went to accommodate the curve for the first one or two longer strands. For the short strands you can zip straight along. I then laid them out to make a half circle and so I could easily imagine where the ribbon needed to go. I then attached a long piece ribbon to the pointy corner of each wing, with a few centimetres between them, so that could go around the neck with a nice bow. I left the bottom corner to just hang, and tied a smaller bit of ribbon on the far end corners to tie around the ribbon. As you can see, I didn’t use the ideal fabric and my cuts are wonky but it still turned out okay! Such a forgiving craft, my absolute favourite kind. I made two pairs to send to my two toddler nephews in New Zealand. It is hard finding crafty present ideas for toddlers and children so I was REALLY happy when my sister-in-law sent a video of her darling boy having a major giggle, flapping about and dancing to Adele. These are now my present of choice for every child!! Posted in Craftiness, Thrifty and tagged . 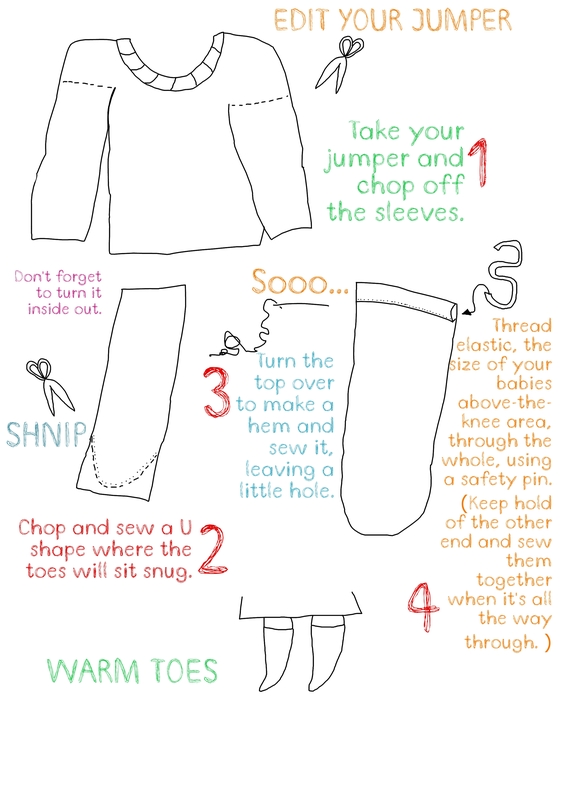 tutorial, children, craft, diy, easy, make, present, sew, toddler, wings. Bookmark the permalink. Hurrah, the sun has popped out this week meaning I have been able to test my latest invention. Unlike my Sock-Sorting-Washing-Line (does what it says on the tin) and my Swellies (soft waterproof wellies for commuters to fold up in their bags!) which earnt me nothing but ridicule despite being completely genius, these made it to prototype stage. And they are a raving success at the trial phase. . . They are little tubes I have sewn out of old packaging, and filled with yoghurt. As hoped, they make a delectable, healthy and cooling snack for my little lass. Yeah, alright, technically Calypso came up with the squeeze-an-ice-pop-out-of-a-tube idea in the nineties. But DID they empower you take something you were gonna chuck in the bin, add ONE line of sewing (or I have even successfully tested a hot glue gun version) and make your own that you can use FOREVER? I can not explain how EASY this is, and how magically they work. They just squeeze straight out the top, the kids munch ’em up, you give them a little clean and fill them up again/ put in a drawer for another time. I used my own homemade yoghurt (yeah, we are well hippyville like that, recipe is here) mixed with some whizzed up strawbs that had gone slightly too soft. 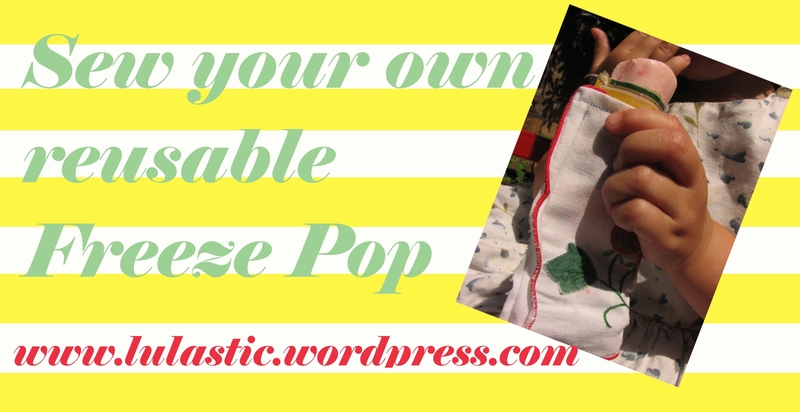 I also took it too another level – sewing some little sleeves out of some cute old serviettes to fit over the plastic tubes – suiting our whimsical garden where most lolly pop devouring occurs. It serves a dual purpose of preventing little hands from falling off from freezing temperatures and also soaking up the excess juices. It was just a case of cutting enough fabric to fit round the tube, sewing the two long ends together and hemming to open top and bottom. 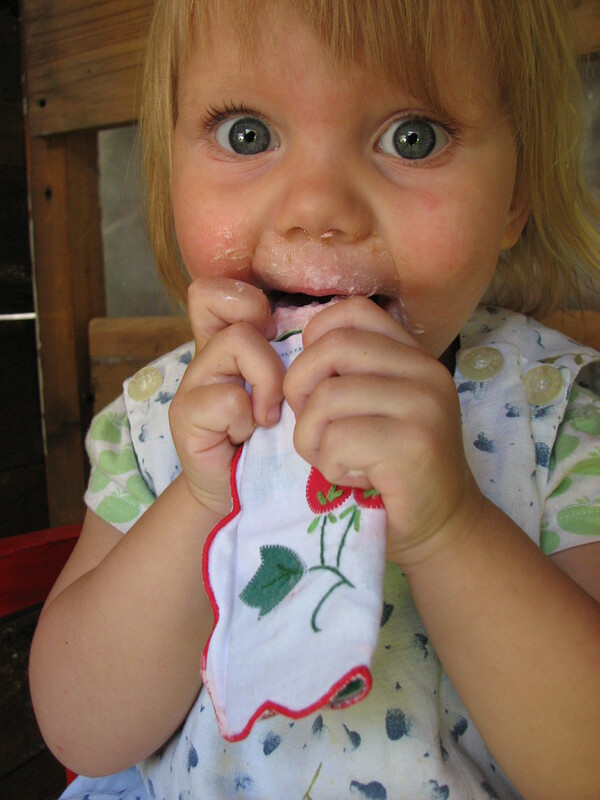 PS – Notice how I don’t really know what to call these icey-yoghurt-things-in-a-tube. Freeze pops? Ice pops? 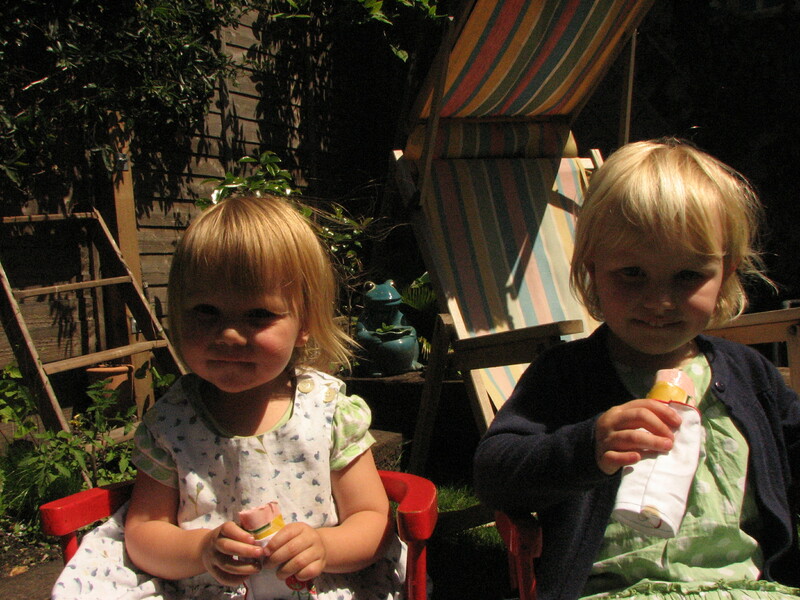 Ice lollies? Ice Lolly containers? Neither google nor Twitter came to the fore here – someone helpfully suggested “Lolly pop without a stick”. Gah. What do you reckon? 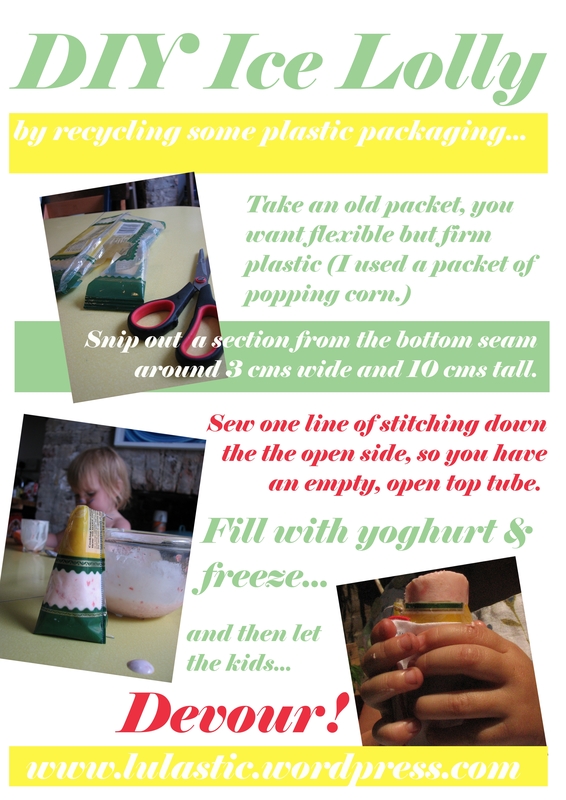 Posted in Craftiness, Thrifty and tagged diy, freeze, frubes, ice lolly, ice pop, packaging, pop, recyle, sew, tube, yoghurt. Bookmark the permalink.